Clean energy will have to at least treble in output and dominate world energy supplies by 2050 in order to avoid catastrophic climate change, a UN report is set to conclude on Sunday. The report produced by hundreds of experts and backed by almost 200 world governments, will detail the dramatic transformation required of the entire globe's power system, including ending centuries of coal, oil and gas supremacy. 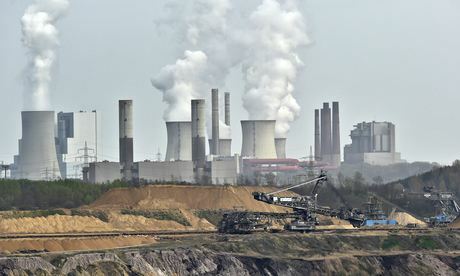 Currently fossil fuels provide more than 80% of all energy but the urgent need to cut planet-warming carbon emissions means this must fall to as little as a third of present levels in coming decades, according to a leaked draft of the Intergovernmental Panel on Climate Change (IPCC) report seen by the Guardian. There is heavy emphasis on renewable energy, such as wind and solar power, and cutting energy waste, which together need hundreds of billions of dollars of investment a year. But despite the scale of the challenge, the draft report is upbeat: "Since , many renewable energy technologies have substantially advanced in terms of performance and cost and a growing number have achieved technical and economic maturity, making renewable energy a fast growing category in energy supply," the report says. It also highlights that the benefits of clean energy, particularly in reducing deadly air pollution and providing secure energy supplies, "outweigh the adverse side effects". The IPCC report is the last part of a trilogy compiled by thousands of the world's most eminent scientists which gives the most definitive account of climate change to date. The first report, released in September, showed climate change was "unequivocally" caused by human activity and prompted Ban Ki-moon, the UN secretary general, to say: "The heat is on. Now we must act." The second, published in March, warned that the impact of global warming, from extreme weather to reduced food production, posed a grave threat to humanity and could lead to wars and mass migration. TheInternational Energy Agency said the IPCC's work showed "the urgent need of enabling a global transition to clean energy systems". The report will address how to avert the worst dangers by cutting carbon emissions, which have been rising despite the global recession of 2007-08. Nuclear power is cited among the low-carbon energy sources needed, but the draft report warns it "has been declining since 1993" and faces concerns about "safety, nuclear weapon proliferation risks, waste management security as well as financial and regulatory risks". Another way to produce low-carbon energy is to burn fossil fuels but capture and bury the carbon emissions. The IPCC experts note that, unlike renewable energy, this technology "has not yet been applied at a large, commercial scale". The draft report concludes that increasing carbon emissions are due to rising coal use, along with increasing demand for energy from the world's growing population. But it notes that policies implemented to cut carbon emissions will also cut the value of fossil fuel reserves, particularly for coal. It also says increased use of gas could cut emissions in the "short term", if it replaces coal. China's vast coal burning represents a huge challenge but a new analysis from Greenpeace, published on Friday, suggests it may have reached a turning point. "The range of coal caps and anti-smog measures put in place by the Chinese authorities could see the country cut its carbon emissions by more than twice the UK's annual footprint by 2020, making it possible for global carbon levels to peak before climate change spirals out of control," said Li Shuo, Greenpeace East Asia's climate and energy campaigner. On Thursday, Nobel peace prize winner Archbishop Desmond Tutucalled in the Guardian for an anti-apartheid-style campaign against fossil fuel companies. "It is clear that [the companies] are not simply going to give up; they stand to make too much money," he wrote. Over half a trillion dollars a year are spent subsidising fossil fuels – six times more than spent supporting renewable energy – and US president Barack Obama and other leaders have pledged to phase these out. The draft IPCC report states this could be done without harming the poor: "Many countries have reformed their tax and budget systems to reduce fuel subsidies, that actually accrue to the relatively wealthy, and used other mechanisms that are more targeted to the poor." The draft report runs counter to some of the UK's key energy policies. It states that decarbonising electricity is key to cost-effective cuts in emissions, but the coalition government voted down a plan to do this by 2030. The report also warns that building high-carbon energy infrastructure developments will lock societies into high emissions and may be "difficult or very costly to change", but UK ministers are strongly pushing shale gas exploration. The UK's carbon plan includes significant burning of biofuels and biomass (usually wood), which is supposed to be carbon neutral. But the IPCC report says scientific debate about whether biofuels cut emissions "remains unresolved" and that without policy safeguards "large scale bioenergy deployment could increase emissions". Friends of the Earth's executive director, Andy Atkins, said: "We can only avoid catastrophic climate change if we reduce our dependency on fossil fuels – we're already on track for four degrees warming, which will be impossible for human society to adapt to. We have the technology to prevent dangerous climate change. What we lack is the political will of our leaders to strongly champion renewable power and energy efficiency." Li said: "We stand at a fork in road. One way leads to more dependence on dwindling fossil fuels that are wrecking our climate and damaging our health; the other to a world powered by a booming clean energy sector that is already driving growth and creating jobs. The sooner we act, the cheaper it will be."